This trio lends itself perfectly to enhancing your buffet line. Elevate serving platters, pitchers or bowls. Largest riser measures 8″ L x 8″ W x 8″ H. The next size measures 7″ L x 7″ W x 6″ H. And the smallest riser is 6″ L x 6″W x 4″ H.
Tray measures 21-1/2″ long x 12-1/2″ wide. Perfect for displaying fruit, cookies, rolls or breads. Perfect for tabletop use, tabletop presentation, or on the buffet line. Perfect for large salads or side dishes of all kinds! Web Basket measures 9-5/8″ across at the top of the basket. This is a dynamic addition to your tabletop or buffet. A sturdy basket that looks so elegant ~ Guests are guaranteed to ask where you got it! 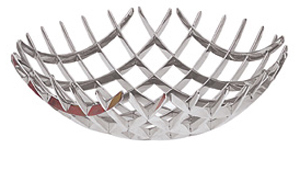 A tighter lattice pattern design and slightly graduated uplifted sides lend to myriad ways in which to utilize this piece of tableware. 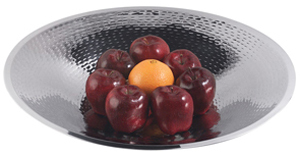 This platter is an impressive 11-3/4″ wide. Combine this piece with our Hammered 3-Piece Risers (Item #XC3198*3) for a beautiful, elevated display. Staircase Riser and the Curved Staircase Riser create a stunning display. stainless steel lends a very airy appeal to the structures. Pair these with a tall centerpiece display, and create a breathtaking view. Our Hammered Display Wheels are a perfect complimentary piece to the Staircase Risers. Use the Wheels in the center of your display, and place the Staircase Risers on either side. 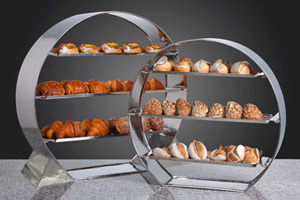 For additional display pieces, add the (trio) Hammered Risers at the end of your buffet, for a complete look. The Large Hammered Display Wheel stands 29-1/8″ tall x 30-1/4″ wide, with a 7-5/8″ framework. The Medium Hammered Display Wheel stands 24″ tall x 25″ wide, with a 6-5/8″ framework. The Wheels are a brilliant, hammered finish, but the three hook-on shelves are a mirror-polished finish. The combination of the two finishes creates a stunning look. 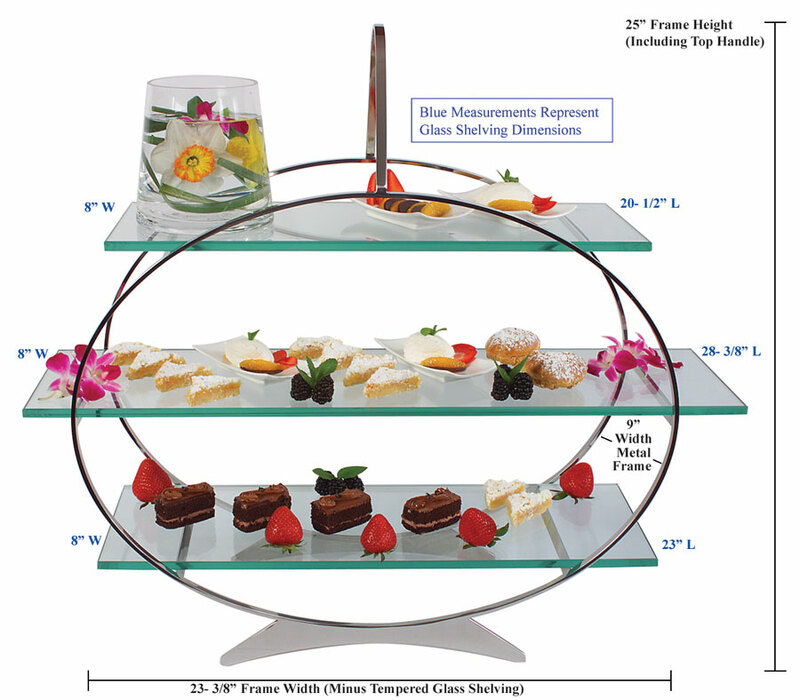 Perfect for amuse bouche (small tastings) for desserts or appetizers, layered sweets, or sandwiches, these display pieces are sure to become a favorite with your guests. 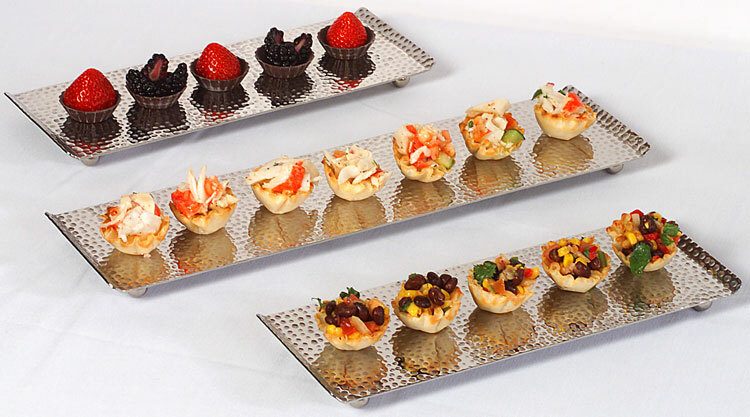 Removable trays can be used as runners down a buffet table as centerpieces, or can be used for butler-passed appetizers/individual tastings/beverage samples. The individual trays can be used for tableside service, as well. Additional Medium Trays are Item # XC3254T*3 ~ Two shelves measure 19-3/4″ L x 6-5/8″ W. Center shelf measures 23-3/4″ L x 6-5/8″ W.
Additional Large Trays are Item # XC3255T*3 ~ Two shelves measure 25″ L x 7-3/4″ W. Center shelf is 29-1/8″ L x 7-7/8″ W.
The perfect display for bite-sized appetizers! Tray allows for two-sized serving. Remember to order additional trays ~ One set for display, the other for replenishment. 18-1/25″ H x 5-1/4″ W x 16-1/2″ L (Measurements are with the trays on the stand. Height includes the handle). 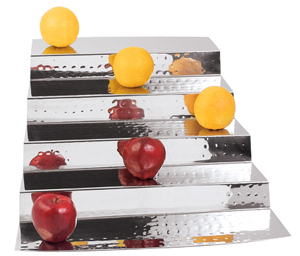 The removable trays can be used for tableside serving, or as tabletop centerpieces ~ See Below. 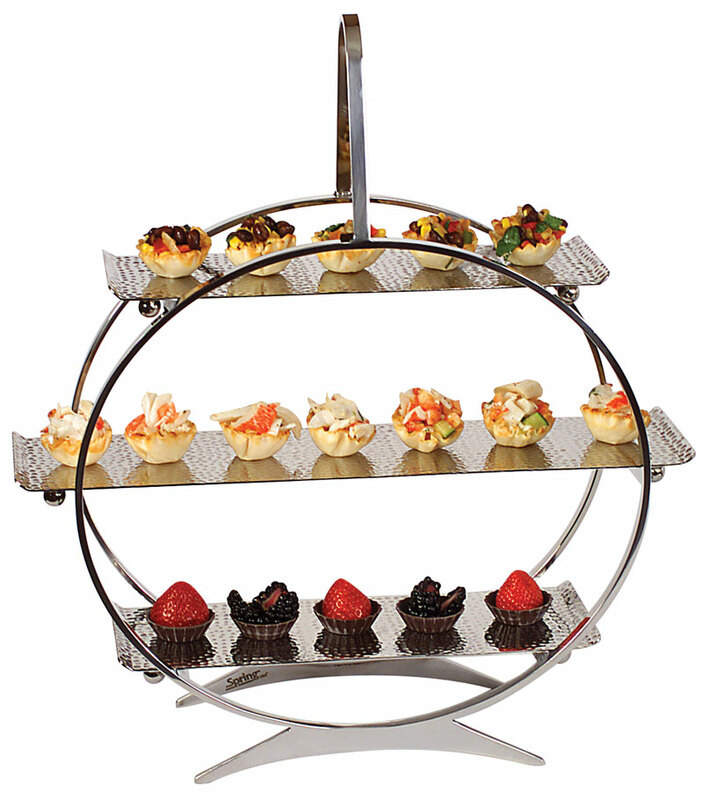 Perfect to pull off the Display Stand and use directly on a tabletop for small appetizers! Trays make an impressive display as stand-alone pieces, or in groups of three. 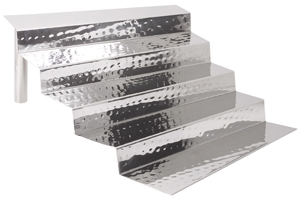 Trays are 18/8 Stainless Steel. This Oval Display Stand is so appealing, because of the light, airy look of the product once it is displayed on the tempered glass trays. Detachable rubber bumpers keeps the tempered glass trays from moving, once placed inside the framework of the stand. Remember to order an additional set of tempered glass trays ~ one set for display, one set for replenishment! Additional Trays can be ordered – See Item # XC1102-2. Replacement set of three, tempered glass display trays, for use with the Oval Display Stand. A secondary set of trays allows you to have one on display for your Guests, while the other set is being prepped in the kitchen. Each glass tray measures 8″ wide. One tray is 20-1/2″ L, the other measures 23″ long and the longest tray is 28-3/8″ long.